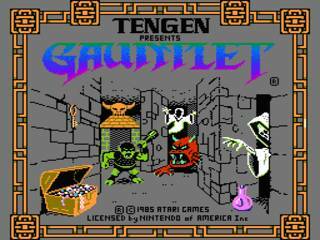 Originally released as a 4-player Arcade game in 1985, Gauntlet came to NES in 1987. Play as Thor the Warrior, Thyra the Valkyrie, Merlin the Wizard, or Questor the Elf as you explore a labyrinth teeming with deadly creatures. Can you retrieve the Sacred Orb from Morak the Evilone or will you perish inside of his deadly gauntlet? Best time as Elf: Single-segment 0:15:55 by Jeff Feasel on 2014-07-11. This game was requested by my stream viewers, so I picked it up again after letting myself get terribly out of practice over two years of not playing it. This run had great random-exit luck, which is what counts in a speedrun. Thanks a million to Gram2, keefry, EntroperZero, GiraffeMe, SonOfOrpheus, CountNeko, Inegotiatewithterrorists, zondervan, CarpetCrawler, vid3odrome, Conradson, puchiedarcy, ToastedZergling, magicbwho, sharif162, bybzii, copota, Joshy_D, TheMageling, Neegnaro, Liquid_flood, MGShadow, nomadHAR, JamesInDigital, ItotheCtotheE, randy_crackstick, Wawlconut, simpoldood, bichphuongballz, jkoper, and Dragondarch.